Projector's Product Talks are informal meetings with designers. This format is all about short speech and then a discussion where you can ask questions. Viktoriia Leontieva is an end-to-end designer with 8 years of design experience (varying from visual to UX and research). For the last 5 years she worked at a number of startups in Berlin, Germany (currently at zalando.de, previously at YND Berlin, 8fit, Wimdu, etc.). She takes interest in psychology, social studies and neuroscience and enjoys finding parallels between them and design, introducing them into her own work process. For centuries, the scientific method (and later the scientific thinking) has been used to validate all kinds of hypotheses in various sciences — chemistry, physics, geology, and psychology. Scientists from different scientific areas use the same core approach to find answers that are logical and supported by evidence. Within our life framework we too explore environment through experimentation. 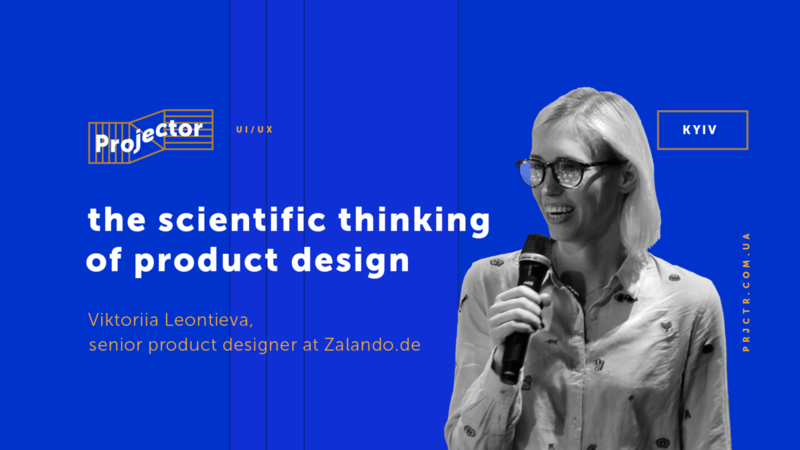 In this talk Vic will draw the parallel between the scientific thinking and product design, and how it can be introduced into our design workflow. — Example of a full cycle of product design based on the scientific thinking insights.